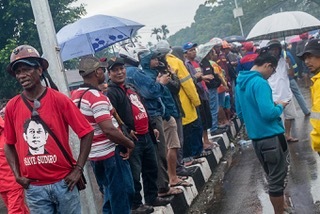 Taking a stand: Workers of US-based gold and copper mining company Freeport Indonesia stage a rally in front of Timika District Court on April 20. Two employees of US-based gold and copper mining company PT Freeport Indonesia, who were victims of a rubber bullet shooting allegedly committed by Timika police personnel on Thursday, are receiving intensive medical treatment at Mimika Regional General Hospital (RSUD) in Timika, Papua. According to RSUD Mimika spokesperson Lucky Mahakena, the two Freeport employees are Andrian W. Santoso and Muhammad Faidsal. Faidsal was reportedly shot on the left side of his buttocks while Andrian suffered wounds to his left leg, directly under his knee. “Two other people who were rushed here have returned home,” Lucky said as quoted by Antara on Saturday, referring to Zainal Arifin, who was shot in his right thigh, and Pukuh Prihantono, who was shot in his left knee. Another Freeport employee wounded in the sole of his foot returned home immediately after receiving treatment by medical personnel at the hospital. The five Freeport employees suffered the wounds during a clash between police personnel and mining company workers who staged a protest in front of Timika District Court on Thursday. The police shot rubber bullets in their attempt to disperse the crowd. Mimika Police chief Adj. Sr. Comr. Victor Dean Mackbon suffered injuries, including a punctured vein, to his left heel because of shrapnel from rubber bullets. He is currently receiving intensive treatment in a VIP room at RSUD Mimika. 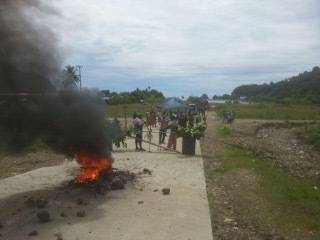 Demta, Jubi – Residents of seven villages led by the heads of each village blocked the Trans road Brap-Demta, Demta District, Jayapura District. Road blocking was triggered by road condition that has been damaged for long time, but failed to repair. Tarfia community leaders Abubakar Eli, one of the villages participated in the action said on April 18th that a palm oil company, PT. SInar Mas has operate and crossed this area since 2000. He suspects the damage is caused by cars/trucks passing carried goods belonging to PT Sinar Mas. According to Eli, residents have organised five demos to demand the road to repair. But until now their demands never responded. “We, the people of Demta District have been very disappointed. We asked the government about the road work from Kilometer 17 to Demta, is it (the improvement) is just a lip service? We demand it now. Do not use us a political object,” he said. According to him, road damage hampered economic activities of the people. Residents who want to sell their farm products to the city were forced to discourage. The protest action coordinator, Oto Tauruy said they blocked the main road to prevent PT Sinar Mas’ vehicles from passing the road. “Public vehicles may pass,” said Oto. The blockade starts from port of Sinar Mas in Demta from the morning until afternoon. Jubi failed to get any explanation from the company. Waisai, Jubi – The Raja Ampat Regency Government, West Papua Province is said to be drafting a draft regional regulation (draft) on prohibition of large-ships and cruise ships entering the area. Head of Legal Division of the Raja Ampat Regional Secretariat, Mohliat Mayalibit, said they are discussing the draft with indigenous leaders. “We are discussing the draft, and we have consulted with West Papua Legal Bureau for the revision,” he told Jubi in Waisai, capital of Raja Ampat, Wednesday April 19th. He said the Raja Ampat regency involves indigenous leaders to formulate the regulation, so they do not feel alienated in their own village. “Iindigenous leaders are involved to keep their customary rights,” he said. In early March the Caledonan Sky-flagged British cruise ship, weighing 4,000s and a length about 90 meters, hit a coral reef in Kri waters, Mios Mansar District, Raja Ampat, West Papua. It is expected after the regulation will be passed; large ships and cruise ships cannot go without control into Raja Ampat coastal, known as the world’s coral reef triangle. Once corrected, the draft legislation will be brought to local parliament to be ratified into a local regulation. “But we will review portions of each authorities such as Sayahbandar, Transportation and Fisheries and Marine Service,” he said. Head of Sorong Syahbandar, Jhoni Silalahi supports the good step of Raja Ampat Regency initiative in designing the rules. Sentani, Jubi – The implementation of Local Regulation (Perda) Number 3 Year 2000 on Sago Forest Area Protection in Jayapura District will soon be evaluated. Member of Legislative Commission B of Jayapura District, Freddy Kaway said it seems that legislation has not functioned. This local regulation has struck with the interests of indigenous peoples’ customary rights. “We forbid any construction of building in sago forest areas, but those who have customary rights are local people, so this is also often became a barrier in the implementation,” he told Jubi in Sentani, Wednesday April 19th. He refer to the facts that some customary rights owners sold their land and turn them to property buildings. Therefore he added, this law will be reviewed for evaluation. Thus, there would be a protection for local potential that still exists in the area. At different occasion, Boaz Enok, Ondoafi (indigenous Papua who owned customary land) in Sosiri village said the problem is the protection of sago trees which regulated in Local Regulation No. 3 of 2000 has not been socialized well to the public. Jakarta, Jubi – Ministry of Health asked the public, especially tourists who want to travel to eastern Indonesia, to be cautious of malaria transmission. Based on data from Ministry of Health quoted in Jakarta, April 19th the achievement of malaria eradication in NTT Province, Maluku, North Maluku, West Papua and Papua is still zero percent, or still considered high endemic malaria. Director of Vector and Zoonotic Disease Control and Prevention at the Ministry of Health, Vensya Sitohang reminded tourists, especially those who travel backpacks and adventure to various remote areas in order to prepare for malaria anticipation. Vensya said the most important anticipation is to keep away from being bitten by anopheles mosquito, the cause of malaria. He suggested, if possible, for tourists not to go out at night when anopheles mosquitoes are more active. “If they have to go out at night, protect the body with lotion, and if sleep must use mosquito net,” she said while suggested people regularly visit the health service for laboratory checks to know whether they are infected. In addition, tourists are also advised to take preventive malaria drugs before traveling that can be obtained at health centers. The drug is given free of charge.